Improve your underwater puzzle-solving skills with this handy guide. If Disney's new game has got its hooks into you but you're struggling with some of the levels, then we've got everything you need to know in today's walkthrough. As well as compiling our top tips for the game, we've also got comprehensive guides to unlocking each of the game's bonus characters. First things first, here's the simple stuff. Your character starts off suspended in a bubble which you'll need to pop with a tap of the screen if you want to make them tumble. If you need to trap them in a bubble to have them float upwards, another tap will add it. Beware! 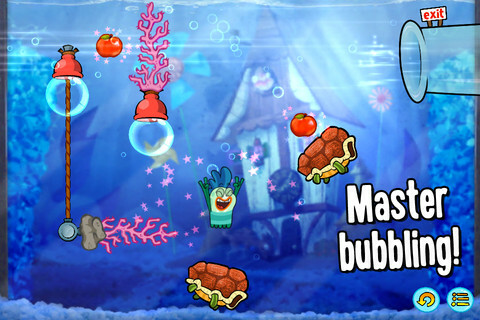 If your character floats past the top of the screen in a bubble, drifts off the sides of the screen, or plummets beneath the seabed you'll lose all your progress and have to start again! First of all, break it right down into component parts. It's usually best to start by working your way backwards from the exit point. Look at what obstacles are in the way. If there's only one way to reach the exit point and it's blocked, the first thing to work out is how to clear it, otherwise all of your efforts will be in vain! 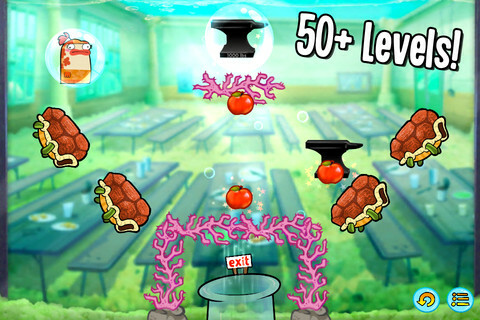 Remember you can always get through a level without collecting any of the apples at all. There's no fun in that, but you can always go back and see how you can work any missing pieces into your solution. 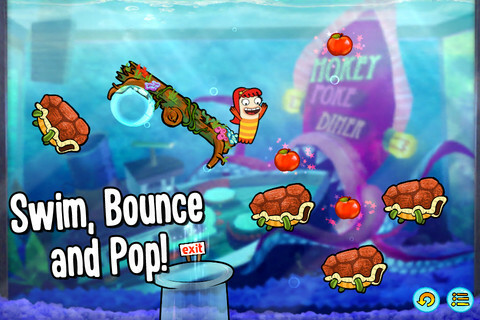 Each stage introduces a new mechanic to the game. Here's our guide to how each of them work, and what you need to do to factor them into your problem-solving. The very first bit of puzzling you'll be introduced to comes in the form of the platforms found in most levels. These are very simple to use and are great for cascading your fishy friends around the screen. Placing a bubble underneath one of the sides will cause it to tilt in the appropriate direction, so play around with them to set up the most efficient chain reaction. Here's where it gets interesting. 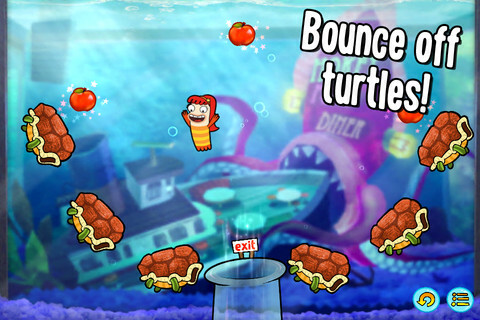 The turtles will launch you around the screen depending on which way they're leaning. If they're completely flat, they'll bounce you straight up in the air. Here's an important thing to remember. You're not trapped in a loop of bouncing back and forth. If you want to land on a different shell, you can always put a bubble around yourself mid-flight, then pop it to land where you want. Avoid at all costs! You'll need to either smash these to pieces with a well-aimed anvil, or use turtles and bubbles to negotiate your way around them. Here's a great trick that the game will never tell you but will save you tonnes of frustration. You can raise the plungers up by placing a bubble underneath them, but you can actually stack bubbles on top of each other to push the plungers even higher. A very handy thing to know indeed, and will make some of the later levels much easier to solve. Tapping on one of these will cause your character to drift towards them. Be careful though because it's not instantaneous! 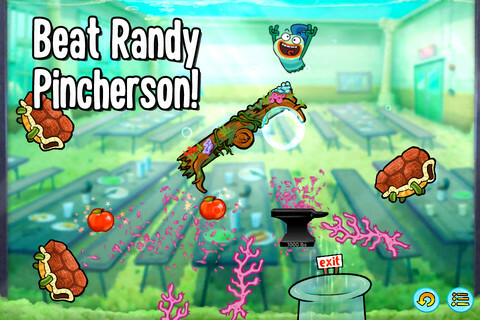 Anything that's in your way will block you, and if that's coral, then you're going to have to restart the level. Again, get used to using these in conjunction with floating bubbles to get yourself in the perfect position. These will drag you in the direction of their flow, but be aware that you must be in a bubble if you want to be carried along by them. Make careful use of turtle shells to get into the perfect position, and don't forget to watch out for any deadly coral that might be in the way. Sometimes you have to switch current streams to pass safely through a level. At the end of each of the game's five sections, you'll have the opportunity to unlock a new character by successfully completing a challenge. Here's the low-down on beating all of them. This one's nice and easy. All you have to do is make sure that all of the spotlights on the stage point directly at Bea. First of all, burst every bubble on the screen and the bottom two lights will point directly at her. Next place a bubble underneath the left-hand side of each platform that's on the left-hand side of the screen. Now do the opposite for the spotlights on the right. Voila! This one can be quite frustrating but it's important to work out the height you should drop each basketball from, and it varies from platform to platform. If the basketball spawns above the furthest right-hand shell, aim for the ball to land on it around the half-way point. If it spawns above the middle platform, drop it so it connects with the shell around a third of its way from the bottom. If it's the left-hand shell, make connection just before that bouncy platform reaches its highest point. There's a little more luck than judgement involved in this particular challenge. The bubbled anvils need to drop either on the bully's head or just to the left, on his shoulder. You can try bouncing the anvil off the turtle shells if it spawns above them, but frankly we found it easier to just wait for an anvil to spawn in the middle, and drop it cleanly onto the bully's head. Just watch out for that travelling turtle shell that will ruin your plans. Clamantha's challenge shouldn't pose you too much of a problem. You need to ride all three of the slipstreams, so start by putting a bubble or two under the first chain until there's a gap between the star and the fish. She'll start moving to the right once you've done so. Burst the bubble under the second chain's plunger to make it drop and she'll drift over to the third and final chain. Put a bubble under the plunger and she'll head right before travelling along the downward stream. Put two bubbles under the plunger that's now to your left. It will raise up, before the final slipstream drags you all the way to the exit. Victory! This is one of the easiest challenges to complete. Head to the bottom-right whirlpool, then teleport to the one above it, picking up the first book as you travel. Next, head left to the middle whirlpool at the top of the screen and score your second book. Burst your bubble and drop down to collect the mauve book, then teleport to the top-center whirlpool the moment you've grabbed it. Next, head to the left-hand whirlpool, drop to pick up the green book, put a bubble around your character quickly and float up to grab the final purple book. Easy!